A couple’s dream day became a tragedy when the father of the bride died suddenly on the morning of their wedding. 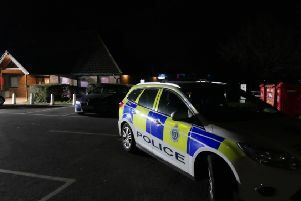 Sam Jenner, 25, was due to marry Gavin Sharples, 34, on Sunday (March 17) at Leeford Place Hotel, in Battle. However, just moments before leaving his Eastbourne home, Sam’s father Brian, 62, fell ill and the wedding was cancelled. Gavin, from Hastings, said: “(Brian) was just starting to get ready to leave Eastbourne and make his way to Battle to get ready when he felt unwell. “I got a call from Sam saying her dad had had an accident but at that time we didn’t really know how bad it was. “It was only when I got another call saying we needed to go to Eastbourne hospital as he was in a critical condition that I realised how serious it was. Gavin said he had just picked up his ten-year-old daughter Sophia – who he has from a previous relationship – and Sam’s brother David when he received the news. The decision was then made to cancel the wedding. Gavin added: “It was overwhelming. We want to raise awareness of what happened. “We know we’re not the only people to experience something like this. People lose a loved one on Christmas Day and birthdays all the time. The couple, who have two children – Lily, 3, and Archie, 1 – have now rearranged their wedding day for September 29 but are struggling to cover the costs of the new date as well as Brian’s funeral. As a result, a fundraiser has been set up to support the couple with any added costs. Gavin added: “The fundraiser is more towards the costs of the funeral as that’s getting really expensive. “In terms of the wedding, the venue has been really supportive, as has the photographer who has been brilliant, but some companies were asking for extra money once we cancelled the wedding and we just can’t cover it. I was quite annoyed with that but I thought there’s no point getting upset with people. “My partner’s mum does have some money aside but it wouldn’t be enough to cover the whole funeral.